The Chicago Jazz Festival is coming! Part 2! | What's on the kitchen boombox? « Listen up: The Chicago Jazz Festival is coming! This entry was posted on August 27, 2008 at 3:11 am and is filed under Uncategorized. You can follow any responses to this entry through the RSS 2.0 feed. You can leave a response, or trackback from your own site. Thanks for your great review. 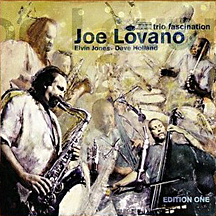 Can not remember having listened to Lovano. The trio sounds impressive from your description!